Years ago, I used to frequent a lovely little restaurant called La Bonne Crepes. Ever since then, I have developed a taste for wonderful savory crepes and on occasion, a delightful dessert crepe. 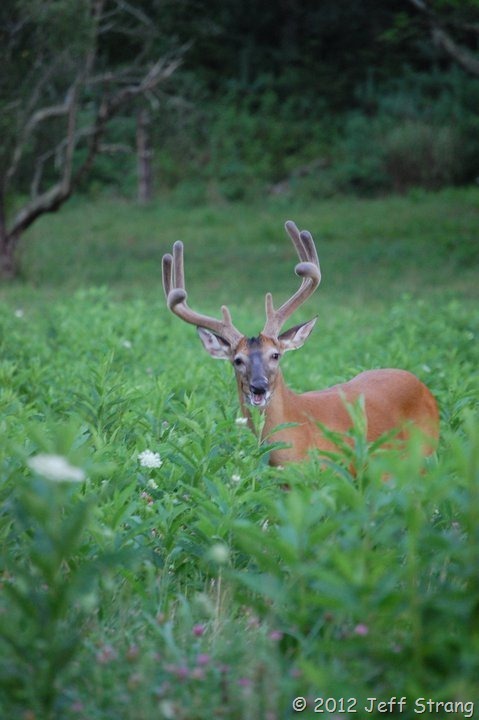 Sometimes I just get a craving for something really good. And often times it needs to be of French or Asian origin! In my mind, I figured that the batter was essentially a thinner pancake batter and decided to plunge right in and just make it without a recipe. Pulling out my larger Pyrex measuring cup, I made my batter: flour, water, salt, a pinch of baking powder and vanilla. Mixed it all together into a thin “pancake” batter and let it set. WRONG!!!! This is why this is my delicious disaster! 3 tbsp melted butter, and enough butter to coat the pan. Place all the ingredients into a blender and pulse together for 10 seconds. Then chill in the refrigerator for an hour. This will let the bubbles subside which will help prevent the crepes from breaking apart. This batter will keep for 48 hours. Heat a small non-stick round pan, coat with butter. Pour 1 ounce of batter in the pan and swirl to spread evenly. Cook for about 30 seconds and flip, cooking for another 10 seconds. Remove from the pan and let cool on the cutting board. Continue with the rest of the batter, letting each crepe cool on the cutting board until all batter is gone. Crepes can be stacked and frozen for up to 2 months or refrigerated for several days. Sweet – add 2-1/2 tbsp sugar, 1 tsp vanilla, and 2 tbsp of your favorite liqueur to the egg mixture. It is obvious that I need to get a proper pan to make crepes, but since the stainless steel one didn’t work out well, I switched to my trusty cast iron pan, and found a little bit better success with it. It was very difficult to flip the crepes and I think mine were much too thick to qualify as a “real crepe.” Once cooled, they did fold easily enough, but they were definitely too thick (blame it on the baking powder!). Recently I picked up some lemon curd and thought that mixed with some other ingredients, would make a wonderful filling for these crepes. Blend together in food processor until smooth. Filling should be thick. Take a cooled crepe and lightly spread a little Nutella in the middle. With a small teaspoon, add a little of the lemon curd mixture and top with banana slices and strawberries and another dollop of lemon curd mixture. Folding the crepes to overlap, then top with banana and strawberry slices and drizzle with the lemon curd mixture. It’s always been my favorite to include lots of fresh fruit for breakfast or brunch and this was no exception. So I decided to add some sliced pears to my plate at the last second! While these crepes didn’t fold as easily as they should and were not the perfectly round shape they are supposed to be, they were delicious. It was a wild combination of flavors and when I do them again, I will probably tone it down a little as the lemon curd was very tart. The Nutella has a very strong chocolate, nutty flavor that is melt-in-your-mouth-wonderful, but together these two very vivid flavors almost over-powered each other. Still, it was very good and I can’t wait to go shopping for a proper crepe pan and start all over. I’m thinking a spinach/mushroom savory crepe should be next! As Julia used to say, Bon Appetit! Every now and then I get a real craving for something really good straight off the stove. This time I was hungry for tofu again. Since I am the only vegetarian in my family, I have these wonderful dishes to myself once they are prepared! I’m a lucky girl! To start, begin by cooking your brown rice. I use a short-grain Japanese brown rice, but any of your favorite brands is fine. I place about a cup of rice into the rice cooker and add enough water to cover it by at least 1/2 an inch. While that cooks, I start preparing the tofu and the vegetables. Usually I just use whatever I have so the recipe is never exactly the same. This time I had fresh broccoli, cauliflower, ginger root, shallots, garlic, sweet yellow onion, and carrots. I added frozen peas and frozen green beans as well. Put about a tablespoon of olive oil in your pan and over medium low heat, sauté the onion, garlic and ginger together until the onions are clear and the garlic and ginger start to brown just a tiny bit. Add your garlic and ginger towards the end so they do not burn. 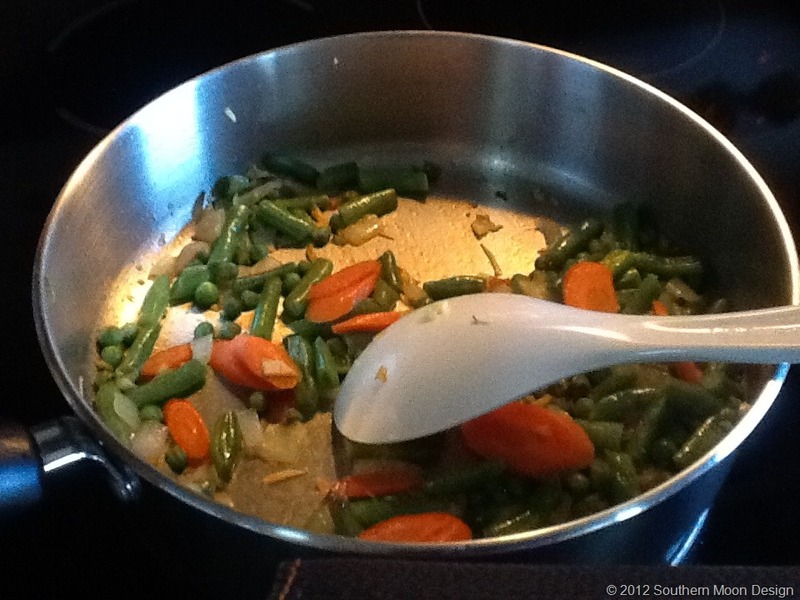 I then add the frozen green beans, frozen peas and sliced carrots to sauté until tender. Take the firm tofu that is wrapped in a paper towel and pat it really dry, soaking up as much of the excess liquid. Slice the block evenly and then cut into bite-sized cubes. 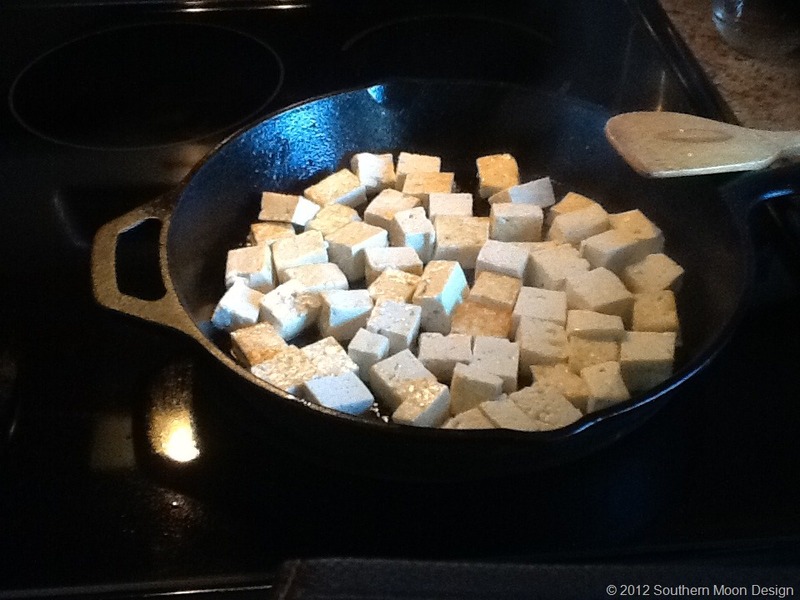 I really like to sear the tofu in my well-seasoned cast iron pan with a little EVOO. Keep turning the cubes until they are browned. This helps prevent them from disintegrating in the stir-fry mixture later. And adds a little bit of “crust” to the tofu. If you have a larger group, 2 blocks of tofu would be plenty or you can add a little chicken, or your favorite meat. As tofu does take a little while to brown, you’ll want to do this at the beginning. If you are not one to have several dishes going at the same time, then start by getting the rice cooking, then sear the tofu. Set it aside, then start the veggies last. 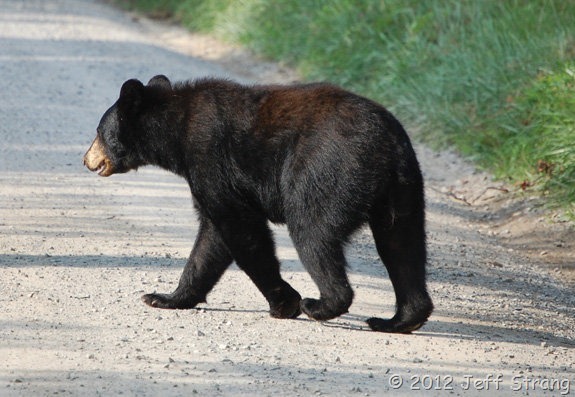 That way there is no overwhelming panic and a reduced chance of burning one of the dishes! 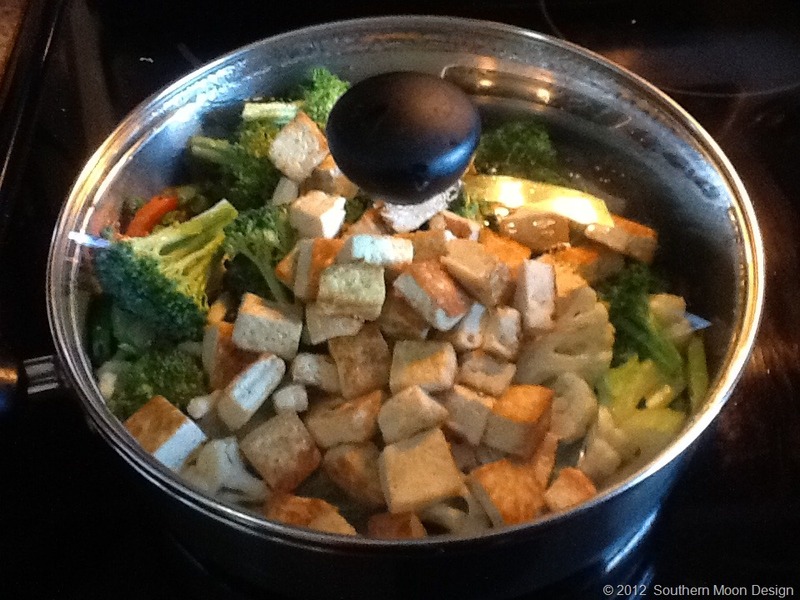 You can also use a non-stick spray and cut back how much oil you would use to sauté and brown the vegetables and tofu. Once the frozen green beans and peas are thawed and bright green, I add the cauliflower and broccoli to the vegetable mix. Let the broccoli turn bright green, then add the tofu. 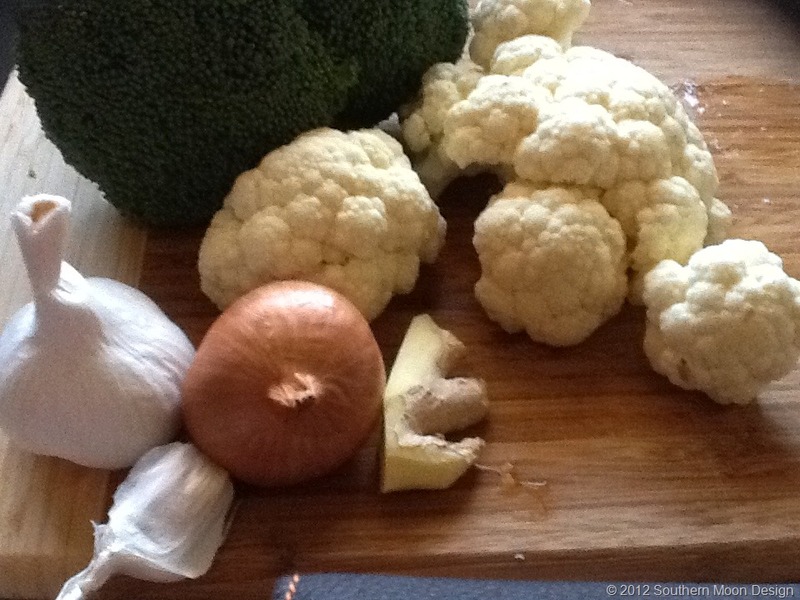 If you like your cauliflower a little softer, cook that with the onions at the beginning. I like my veggies to be bright in color and still crunchy. Once you’ve added the tofu, it’s time to prepare for the sauce. Take 1 teaspoon of cornstarch and put in a measuring cup. Add COLD water, about 1/4 cup, to this add organic soy sauce until you have about 1/2 cup of liquid. Stir to combine completely so there are no lumps. Pour this mixture into the veggie tofu mix and let it heat up. As it heats, it will thicken into a nice brown sauce. Let this sit for just a few minutes for the dish to absorb all the flavors. Gently stir so as not to break anything up and serve immediately! This is one of my most favorite “comfort” foods and I tend to make it quite often. It’s a really good balanced meal and is best enjoyed with a group of friends or family surrounding you at the dinner table! 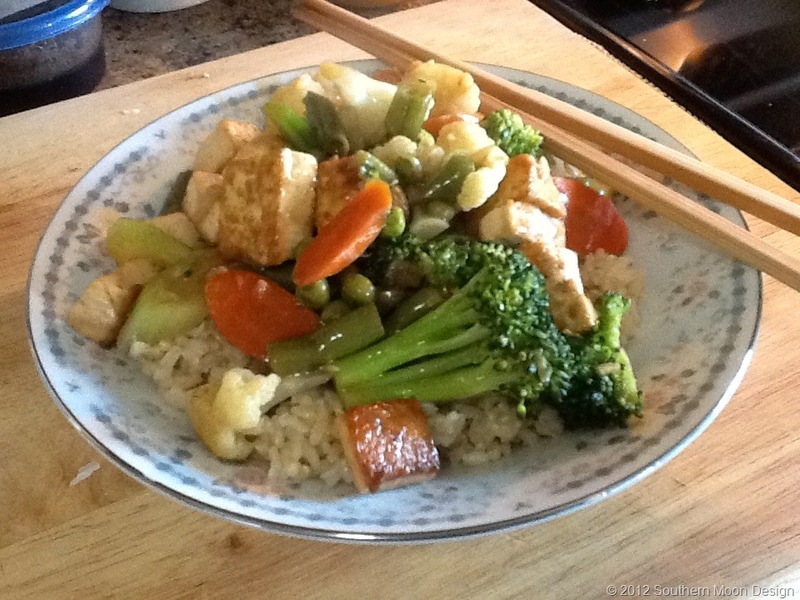 Why not have Meatless Monday or make this dish on Asian night! Healthy and delicious, all in one dish! Enjoy!! !